Cllr Janet Blake of Buckinghamshire County Council has confirmed that local authorities in the East West Rail Consortium will contribute £45m to the scheme to re-instate a railway for passenger services between Bedford and Oxford, Milton Keynes and Aylesbury and beyond. 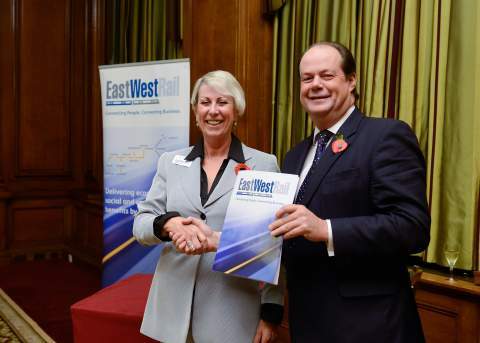 The commitment was given in a letter presented to the Under-Secretary of State for Transport Stephen Hammond MP at a VIP event hosted by the East West Rail Consortium and the All Party Parliamentary Group for East West Rail, held at the Institution of Civil Engineers on Monday 11th November. In July 2012, the Department for Transport announced its support and funding for the Consortium’s proposal to upgrade and re-open sections of the former ‘Varsity Line’ between Bedford and Oxford, Milton Keynes and Aylesbury in its 2014 to 2019 five year-spending plan. A condition of funding was that there must be a local financial contribution to the scheme. “Members of the East West Rail Consortium have worked single-mindedly to establish a robust business case for the re-instatement of an east-west rail link to improve transport connections within the region and nationally. Through independent economic assessment by Oxford Economics the Western section of East West Rail was forecast to generate some 12,000 new jobs and boost the regional GDP by £38m per annum. The minister acknowledged that East West Rail was a pioneering project and in addition to thanking the Consortium for their contribution, acknowledged that the local knowledge and expertise of the local authorities within the Consortium would continue to be important to the successful delivery of the railway. The event was attended by an invited audience of MPs, councillors, business leaders and senior rail industry representatives. 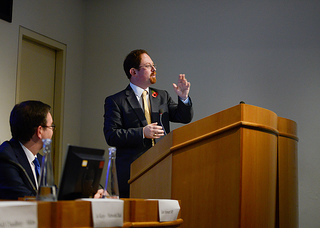 Julian Huppert, MP for Cambridge and Deputy Chair of the APPG, said the development of the Western section was excellent news but that realising the full vision for East West Rail was the most exciting prospect, providing a rail link all the way from East Anglia, through Cambridgeshire, Bedfordshire and Buckinghamshire for the first time. Jo Kaye, Director at Strategy and Planning at Network Rail, told guests about progress to date on the Oxford to Bicester section of the East West Rail and spoke of Network Rail’s commitment to develop the scheme from Bicester to Bedford for the services proposed by the East West Rail Consortium and to incorporate the further enhancements proposed by the Department for Transport to ensure the scheme would deliver long-term benefits. Adil Chaudhrey, Project Director at Atkins, explained the work that Atkins are currently undertaking on behalf of the East West Rail Consortium will identify the economic benefits that may be derived from improved infrastructure and transport links in the region. This will form a foundation for subsequent work to develop a business case for the extension of the East West Rail line east of Bedford.